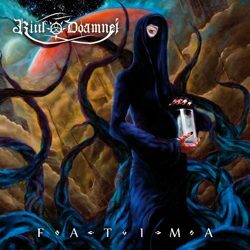 Despite the fact they were formed back in 1999 and have toured and cooperated with many big bands of the genre, Italian symphonic black metallers Riul Doamnei remain relatively unknown to the masses. After the demo “Stramoniologie des Geistes” in 2002, the band released the EP “Le Serpent Rouge” in 2006. Next year their debut full-length album “Apocryphal” was out by the French label Deadsun Records. In 2011 it was re-released by the Russian label Grailight Productions, with two bonus tracks. In the end of the same year their long awaited second album “Fatima” was unleashed by the French label Axiis Music and many things have changed in their sound. In my opinion “Apocryphal” is a very underestimated album. The band played excellent melodic symphonic black metal and their music resembled a lot of earlier Cradle of Filth, especially in the vocals. They tried hard though to add their personal stigma and character in the music and their efforts were successful in this second work. “Fatima” is a much more complete album, a very professional release, with a killer production and improved sound. The term symphonic black metal isn’t enough to describe their music. Riul Doamnei have a fresh modern sound, trying to mix the best elements of all extreme metal genres. So their guitar riffs have the rhythmic sharpness of thrash metal, their production the heavy sound of death metal and their melodies the dark mystical atmosphere of black metal. This time Federico’s screaming vocals sound very expressive and powerful, with more personality. Patty Simon, with her beautiful female operatic and choral vocals, gives an unworldly, eerie atmosphere to the album. Another worth mentioning fact is the guest appearance of Sakis Tolis (Rotting Christ) on the song “Of Misery and the Final Hope”, for which the band has also made a video-clip. “Fatima” consists of 12 songs and it lasts for more than 58 minutes. Each composition is a separate entity, with its own atmosphere and identity. Some songs are more symphonic, others less melodic and more aggressive, while some of them, like the closing “The Fourth Daughter”, have an oriental approach. It is a concept album based on the figure of Virgin Mary and the famous mysteries and secrets of Fatima, while all lyrics are in English and you can find them in their extended 20-page booklet. Concluding, I believe that “Fatima” is a great example of symphonic black metal, with a solid guitar-based sound and a powerful mainstream production. I prefer the more melodic / symphonic parts of their music, but this has only to do with my personal taste. The album is released by Axiis Records and it comes with the amazing cover artwork “The Miracle and Apocalypse” illustrated by Gabriele Verlato. You can give Riul Doamnei a chance and get a taste of their music following the links below.